Glary Utilities 'Duplicate Files Finder' is a powerful search engine that can easily locate and remove duplicates of the same file before they cause system instability. It will deep scan for all types of files - photos, music, films, video, Word documents, PowerPoint presentations, text files. Removal of duplicate files from your system will organize your data and will increase your system speed as it has now to scan lesser files. 1.The Second Line Button: quick access button to "scan for duplicate files" on the fixed drive, "delete checked files", "exclude this folder from future searches" or "check intelligent" on the duplicate file. 2.Left-hand Box: click the file type on the left side to narrow down the results of the search on the duplicate files. If you click on a file type, a long list of related files with some information are showed, such as its name, size. 3.Right-hand Box: you can preview the picture from the upper box and some detailed information is showed on a selected file on the below box, such as file name, the path, size, date modified and its file state. 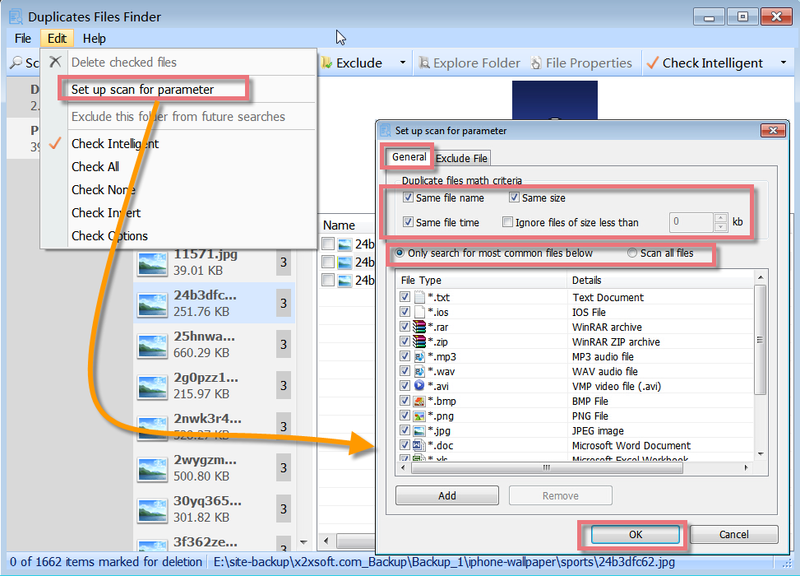 Duplicate Files Finder can scan all parts of a drive, searching for a large number of the duplicate files. It offers a quick and effective way to find the same files from local disks or folders and will show you a list of duplicate files on the drive. Just click "Scan for duplicate files" and choose the drive or the folder you want to scan, and then click on "Scan" button, all kinds of duplicate files will be showed at once. 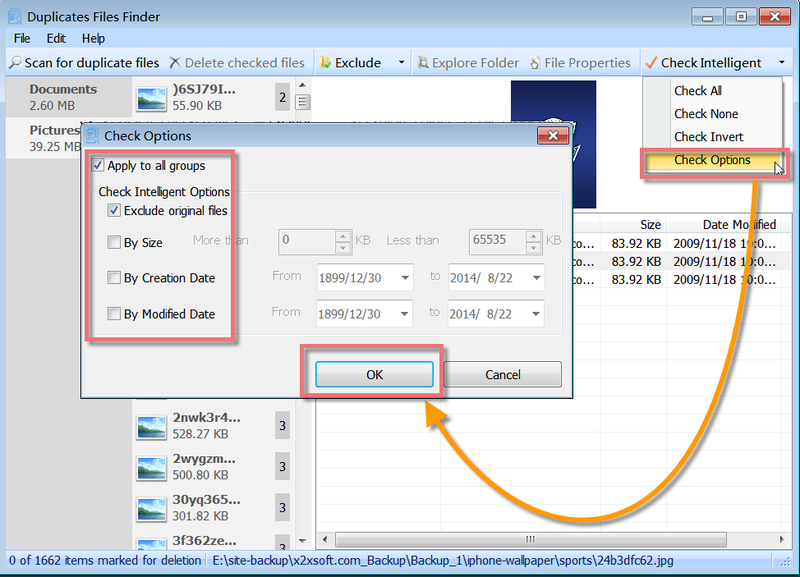 Duplicate Files Finder allows you to set up scan for parameter. You can click "Edit" -> "Set up scan for parameter", a new box will popup. Here you can select duplicate files match criteria and select to scan all files or only scan for those file types that are in the type list. It supports custom matching conditions by file type, file name, size, and date of creation to find your duplicate search.Photos, music, Word documents, videos - you name it, if it appears twice on your system then Duplicate Files Finder will find it. Duplicate Files Finder can deep scan for all types of files takes only one or two clicks and send them to the recycle bin with your permission. To save you much time on checking duplicate files, Duplicate Files Finder offers a powerful feature that can check more than one duplicate file group at a time. Just click "Check Intelligent", it can help to check all the duplicate files at once. You can also set up the check intelligent options, including exclude original files, size, creation date or modified date. If you want to check all duplicate files, check none, check invert or schedule the check options, just click an inverted black triangle symbol beside "Check Intelligent". Click 'Scan for duplicate files' to start Scanning wizard. Select the drives/folders on your hard disk you want to scan, by checking the appropriate drives. Then click 'Next' to proceed further. Select duplicate files match criteria and select to scan all files or only scan for those file types that are in the type list. Then click 'Next' to proceed further. 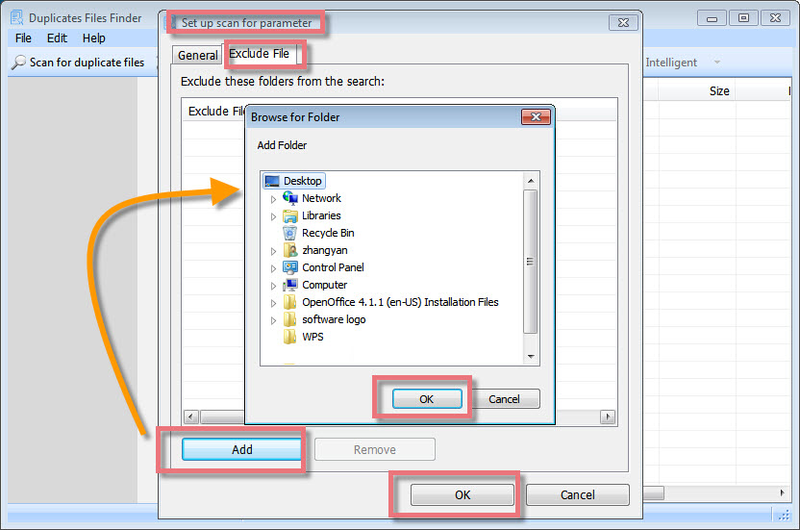 If you would like to exclude a folder that is not currently displayed within the Excluded Folder list, you may do so in the following manner. You'll be presented with a box that will allow you to browse your drives for the specific folder location you would like to add. Select this folder You can also use wildcards (* and ? ) too. Click 'Next' button and wait for the process to complete, this might take some time. All the duplicate file groups will be listed. From each group, keep the original copy, and check mark the duplicate copy, by viewing the properties/viewing the file by opening with its associated program. Click 'Delete checked files' to remove all the check marked files. By default, all deleted files are sent to the recycle bin. 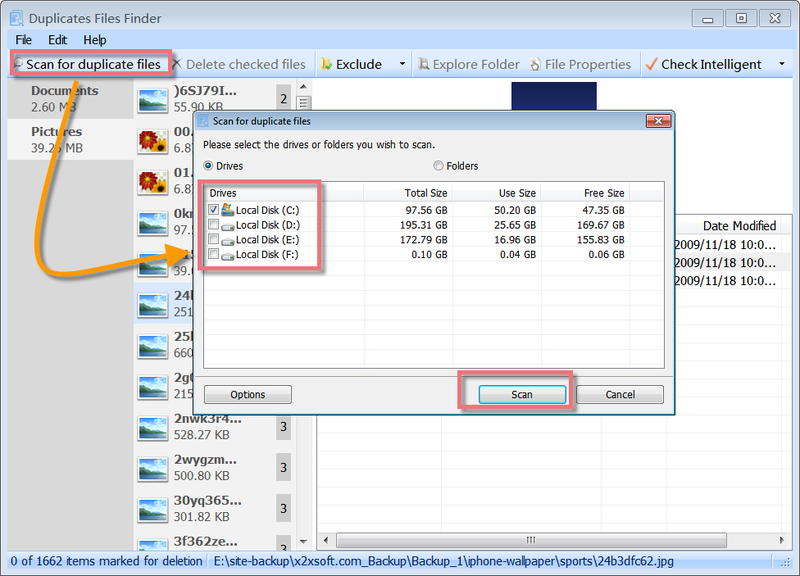 Click "Remove duplicates" below Disk Space, Duplicate Files Finder will pop up. Find and click Duplicate Files Finder icon in the Dock bar, Duplicate Files Finder will appear. If Duplicate Files Finder is not in the Dock bar, click in Dock bar, Duplicate Files Finder will show in a new popup window. Please note: if you want to add Duplicate Files Finder in the Dock bar, click in Dock bar, remove any icon by dragging it out of the Dock firstly, and then drag Duplicate Files Finder in.